You constantly strive to make things better than they currently are. At KCM, we’re always pushing the envelope on how we can raise the bar and serve our Members better. You are not satisfied with the status quo and you eagerly look for opportunities to raise the bar. You’re ambitious and proactive. You don’t stop trying when you reach a hurdle. Instead, you leap right over the hurdle and keep moving toward your goal. You proactively find solutions and ways to succeed. You always learn from your mistakes. At KCM, we realize no one is perfect. We all make mistakes, but the most important thing is to learn from those mistakes. You’re not one to focus on what went wrong. You focus on what you can do better the next time around so the same thing doesn’t happen again. You love solving challenges for people. Development is all about identifying ways that we can help someone. You love empowering people through the tools and technology you provide. You’re a problem solver. You’re driven to discover the root of an issue and determined to identify the best solution to resolve it. You love doing things efficiently. The work you do will have a disproportionate impact on the business. You believe in systems and processes that let you scale your impact to be larger than yourself. You’re eager to learn. Development is an ever-evolving world, as is real estate. You enjoy finding the best and most innovative ways of providing real solutions for clients. Feature Developments: Our Members love giving feedback. And we love giving them what they want. You will enhance our tools and features to make Members’ lives better and add new functionality to improve their effectiveness. Data Integrations: Knowledge is power… and the more we can know about what our Members are doing, what they want, and what they don’t want, will help us serve them better. You will create new ways for us to better understand our Members by tying into data we have (via our site, Infusionsoft, Google Analytics, and other platforms), and data we want to have so we can make better decisions across the board. Debugging Issues: Technology is always changing and whether we like it or not, there are always little bugs to find and fix. You’ll take the lead on identifying and solving issues within our code. Technical Support Lead: Sometimes our Members sometimes need a little extra technical information on things. You’ll be the go-to person when our Support team is working with a Member on a technical topic and needs an extra set of eyes or help troubleshooting. Three or more years experience developing web sites, web applications, and online software, ideally in a multi-site environment. Working knowledge of WordPress or the confidence and ability to quickly learn it. Basic understanding of CRMs, such as Infusionsoft. Comfort in creating an online platform that is user friendly, while also easy enough to manage for users with lower-than-average comfort with technology. In other words, that ability to keep it SIMPLE for our Members. Interest in working as a member of a team. Your role will be web development and programming of course, but you’ll also contribute as a member of the team to the overall growth of the company. Superior written and verbal communication skills in all possible mediums including in person meetings, video chat, phone, email, text and online teamwork portals. Willingness to learn through regular professional development and to hone your craft through any upgrading of skills required to Lead, Own and Exceed in your role. KCM is a pretty awesome place to work. 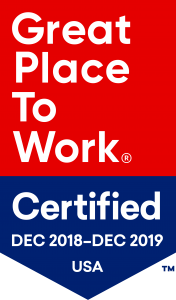 In fact, we’re actually certified as a Great Place to Work! 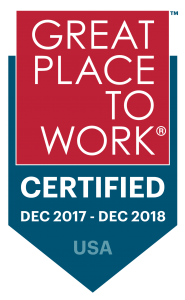 We are also honored to be on Forbes Magazine top 100 best small and medium workplaces in the country list for four years running!